We have three new portfolios for our General Investing option that have higher exposure to risk compared to our original portfolios. Our original portfolios are now referred to as “Core Portfolios”, and we call the new ones “Higher-risk Portfolios”. What’s the difference between Core Portfolios and Higher-risk Portfolios? We don’t qualify our portfolios based on expected returns. Instead, we qualify them based on how much risk to which you’ll be exposed. 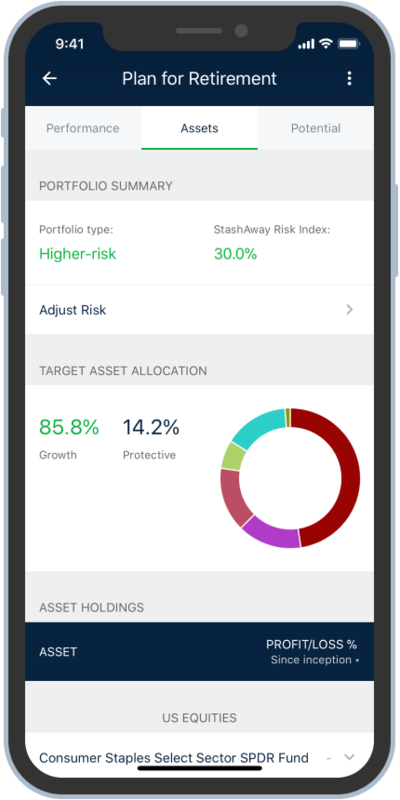 Every StashAway portfolio is defined by the StashAway Risk Index, which indicates the potential loss of the given portfolio. 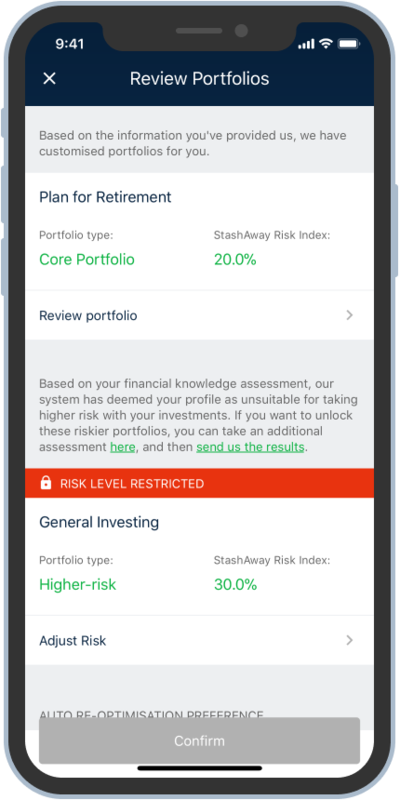 Our Core Portfolios have a StashAway Risk Index between 6.5% and 22%, and our Higher-risk Portfolios have a StashAway Risk Index between 26% and 36%. What's the StashAway Risk Index? To calculate the potential loss of a portfolio in a year, we use Value-at-Risk (VaR). At StashAway, we use 99%-VaR, which can be interpreted as a portfolio having a 99% probability of not losing more than a given percentage of assets in a year. Here’s an example: a StashAway portfolio with $100,000 and a StashAway Risk Index of 10% has a 99% probability of not losing more than 10%, or $10,000 in a year. In other words, there is 99% probability that your portfolio’s value won’t decrease below $90,000 if you select a 10% StashAway Risk Index. What portfolios should you select? Is ‘High risk, high return’ true? The short answer is: in the long-term, on average, riskier investments will generally give higher returns. The key words in that sentence are “long-term” and “average”. In the short-term, riskier investments are more likely to give lower returns and more losses. To learn more about the relationship between risk, return, and time horizon, check out this article that our Co-founder and CEO, Michele, recently wrote to explain what's really behind the phrase. 'high risk, high return'. Then, select 'I want to take a little more risk’. Now, select your preferred StashAway Risk Index. Then, review and confirm your portfolio. Do you get this 'Restricted' message? It is our priority to take the necessary steps to minimise the risk borne by our customers. As such, based on the information you provided when filling out your profile, our algorithm capped your risk limit. If you would like access to all risk levels, there is a short, free online course (will take approximately 2 hours) by SGX that you can take. 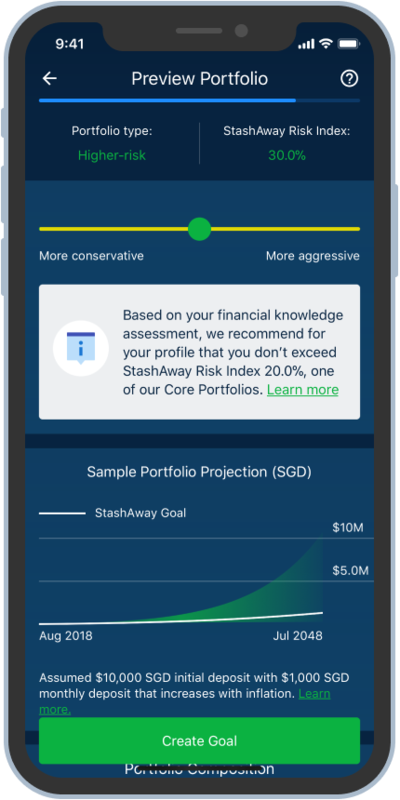 If you score above 90%, please forward the results from SGX to support@stashaway.sg, and we will be able to open up all risk levels for you.